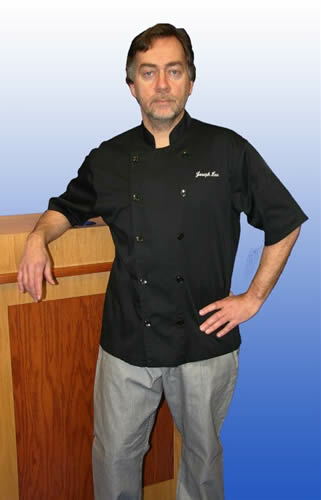 Kitchen Shirts and Basic Chef Coats. High Quality Cook Shirts and Kitchen Shirts made in America. 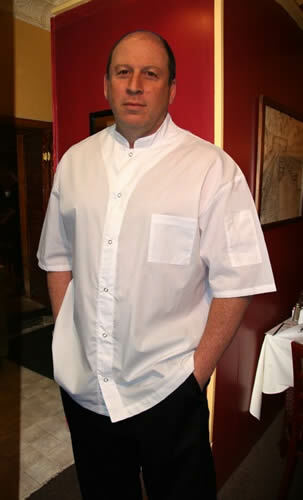 Are you looking for a high quality kitchen shirt that isn't too expensive? Then this shirt is the perfect choice! The fabric is a lightweight brushed poly cotton combed poplin blend; 65% poly to 35% cotton – which means that it's going to be a great wash and wear shirt. The brushed fabric is softer on the skin. This is short sleeve and slightly oversized, giving you plenty of room to move around in it comfortably. There are 5 snaps on the front and it sports a patch pocket on the left side of the chest. This smart looking collared shirt has a straight bottom so it looks great outside pants or tucked in. A great looking kitchen shirt doesn't have to be expensive! This is made in a classic style, with a mandarin collar and 6 snaps going down the front. This is done in a nice crisp looking white fabric that is a lightweight brushed poly cotton blend (65/35). The straight bottom on this shirt is particularly adaptable because it looks good whether you leave it out, over the pants, or tuck it in. There is a patch pocket on the left chest as well as a smaller pocket on the left sleeve. The smaller pocket is great for keeping a thermometer or pen handy. This nicely styled shirt is a bit oversized with slightly dropped shoulders, making for an extremely comfortable fitting shirt. This is definitely better looking than a t-shirt for about the same price. Why not treat yourself to professional clothes? As they say, you're worth it! 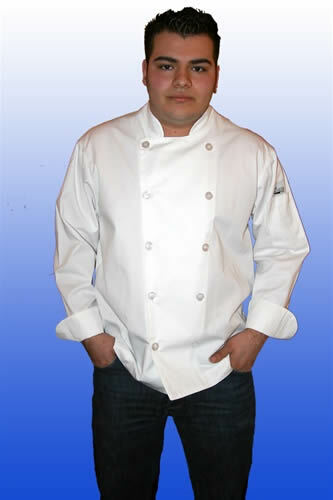 This double breasted classic style white chef coat is perfect for those who need to look great but don't want to break the bank! The jacket comes fitted with 10 white pearlized buttons, and French cuff sleeves, giving you that super professional look in the kitchen. The left sleeve even has a small pocket, perfectly designed for a thermometer or a pen – which ever you need most! This is made out of a nice poly cotton twill fabric that is 65/35 blend. It's a good weight fabric as well - 7 ounces - which means that it's sturdy enough to hold up, but not too heavy. This basic chef coat will look good for a long time to come. And, it's made with care and pride in the US. Black chefs coats always look good, particularly when they're paired with pin striped pants. This jacket has a double breasted style and features 10 black pearlized buttons on the front. The longer sleeves help protect your arms and the french cuffs just look great! The jacket has a nifty smaller pocket on the left sleeve into which you can put a pen or a thermometer. The coat is made in the US and created with reinforced construction throughout. It's made out of a nice soft poly cotton blend twill fabric - 65/35 poly/cotton. And it's a 7 ounce fabric, which means that it's light enough to feel good when on, and sturdy enough to hold up through a ton of washings! 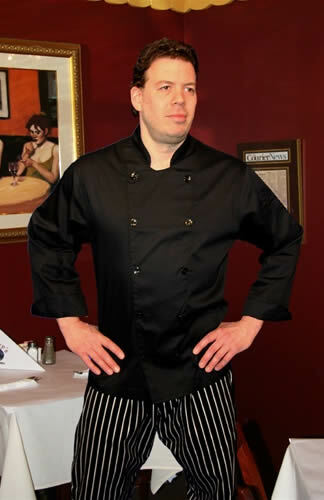 This is super chef coat to own, when you need to look very professional and don't want to spend a ton of money. It's created in the classic double breasted style with 10 hand tied knot buttons on the front. The short sleeves are especially nice for those who just heat up in the kitchen. The mandarin collar is a chef coat classic. This has a nice addition of a small pocket in the left sleeve for a thermometer or pen. The straight bottom on this jacket keeps you looking trim even when it is not tucked in. It's made out of a 7 ounce poly cotton (65/35) twill blend fabric. This coat is a great choice when you need your clothes to last and look good for a long time. Are you looking for a good quality basic chef coat? Then, consider this one. Fashioned in the typical double breasted look, this jacket has 10 black pearlized buttons across the front. 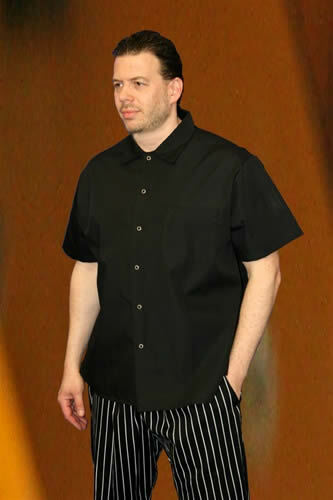 The short sleeves are perfect for those who just get too hot in the kitchen to wear anything longer. Created from nice quality fabric that is a 65/35 poly cotton blend twill. There's a handy small pocket on the left sleeve, perfect for a thermometer or a pen. The coat is straight across the bottom and has a mandarin collar. A great buy for a well built coat from an American clothing manufacturer. Mens US 32"-34" 36"-38" 40"-42" 44"-46" 48"-50" 52"-54" 56"-58" 60"-62"
* Love these cook shirts and basic chef coats but live outside the US? Contact us, tell us where you live and what you want to buy and we'll send you an exact shipping quote. 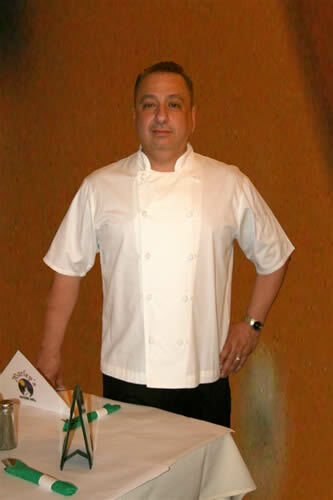 These kitchen shirts and basic chef coats are made with care and pride in the USA. The fabric is American made as well. And it's a nice fabric - not a cheap quality that you might be used to with imported poly/cotton blends. You have a choice about where to spend your money. We consider it an honor to represent products made in the USA.